This variant of the model was created by Penny Noble of Oxford University, and represents the parameters given for the M-cell variant in Ten Tusscher et al. 2004. A stimulus protocol component has been added to the model to allow simulation of trains of action potentials. This file is known to run in OpenCell and COR to recreate the published results. The units have been checked and they are consistent. ABSTRACT: The experimental and clinical possibilities for studying cardiac arrhythmias in human ventricular myocardium are very limited. Therefore, the use of alternative methods such as computer simulations is of great importance. In this article we introduce a mathematical model of the action potential of human ventricular cells that, while including a high level of electrophysiological detail, is computationally cost-effective enough to be applied in large-scale spatial simulations for the study of reentrant arrhythmias. The model is based on recent experimental data on most of the major ionic currents: the fast sodium, L-type calcium, transient outward, rapid and slow delayed rectifier, and inward rectifier currents. 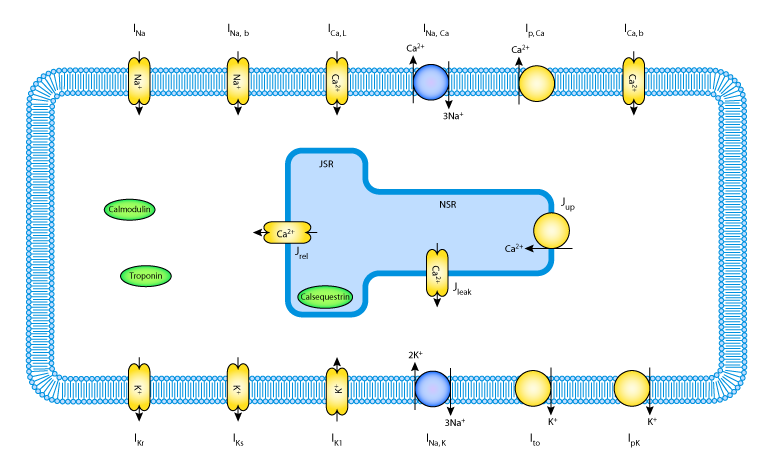 The model includes a basic calcium dynamics, allowing for the realistic modeling of calcium transients, calcium current inactivation, and the contraction staircase. We are able to reproduce human epicardial, endocardial, and M cell action potentials and show that differences can be explained by differences in the transient outward and slow delayed rectifier currents. Our model reproduces the experimentally observed data on action potential duration restitution, which is an important characteristic for reentrant arrhythmias. The conduction velocity restitution of our model is broader than in other models and agrees better with available data. Finally, we model the dynamics of spiral wave rotation in a two-dimensional sheet of human ventricular tissue and show that the spiral wave follows a complex meandering pattern and has a period of 265 ms. We conclude that the proposed model reproduces a variety of electrophysiological behaviors and provides a basis for studies of reentrant arrhythmias in human ventricular tissue. A schematic diagram of the Ten Tusscher et al. 2004 mathematical model of the human ventricular myocyte. Derived from workspace Tentusscher, Noble, Noble, Panfilov, 2004 at changeset 941ec8e54e46.